CADILLAC PUZZLE COUPE DEVILLE PUZZLEBUG NEW 500 PC 2015 PINK CAR AMUSEMENT PARK. I try to describe the overall condition as best possible. 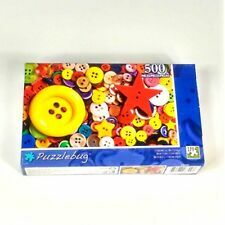 Colorful Silk Pareos Puzzle. New 500 pieces, 18-1/4" X 11". When finished size is 18.25" x 11" If you have any ?. s, feel free to ask. I will not accept SASE. 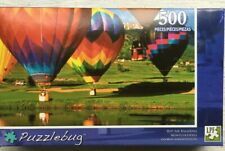 New Puzzlebug Jigsaw Puzzle Balloon Take-off, Albuquerque 500 Pieces Piezas Sealed Crazart. Puzzlebug Balloon Take-off, Albuquerque. Puzzle Number: 5500. United States of America Land of the Free 500 piece CraZArt Jigsaw Puzzle! NIB! Title is Picnic For Two. Item number 1101 from the year 2011. WE DO THE BEST WE CAN TO DESCRIBE THE CONDITION. New in box, 18.25 in x 11 in. New 50 0 pieces, 18.25" X 11". New 500 pieces, 18-1/4" X 11". On the Farm Puzzle. New 500 pieces, 18-1/4" X 11".